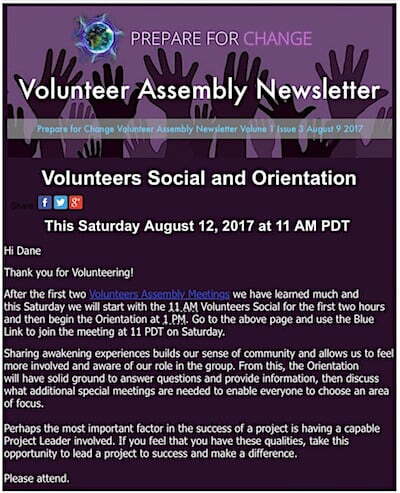 After the first two Volunteers Assembly Meetings we have learned much and this Saturday we will start with the 11 AM Volunteers Social for the first two hours and then begin the Orientation at 1 PM. Go to the above page and use the Blue Link to join the meeting at 11 PDT on Saturday. Sharing awakening experiences builds our sense of community and allows us to feel more involved and aware of our role in the group. From this, the Orientation will have solid ground to answer questions and provide information, then discuss what additional special meetings are needed to enable everyone to choose an area of focus. Perhaps the most important factor in the success of a project is having a capable Project Leader involved. If you feel that you have these qualities, take this opportunity to lead a project to success and make a difference. The Assembly needs staff to function properly and if this role interests you please sign-up for the VA-Staff Team to discuss how you can help create classes and activities for everyone. A special function within the Assembly is the Project Formation Team, which is pivotal to Volunteer participation in Projects supporting the PFC Mission. Prepareforchange.net needs help with content for the site and also for creating downloadable files for our members to use when presenting about the Event and New Society. Please use the link to join the discussion about roles to do this. 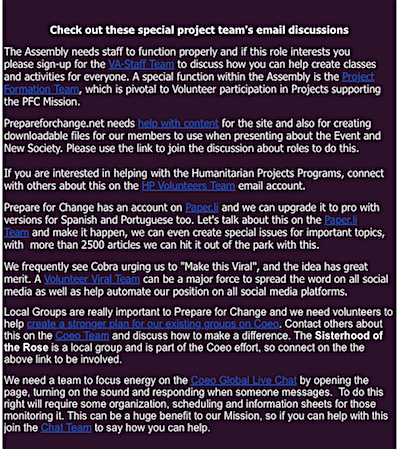 If you are interested in helping with the Humanitarian Projects Programs, connect with others about this on the HP Volunteers Team email account. Prepare for Change has an account on Paper.li and we can upgrade it to pro with versions for Spanish and Portuguese too. Let’s talk about this on the Paper.li Team and make it happen, we can even create special issues for important topics, with more than 2500 articles we can hit it out of the park with this. We frequently see Cobra urging us to “Make this Viral”, and the idea has great merit. A Volunteer Viral Team can be a major force to spread the word on all social media as well as help automate our position on all social media platforms. Local Groups are really important to Prepare for Change and we need volunteers to help create a stronger plan for our existing groups on Coeo. Contact others about this on the Coeo Team and discuss how to make a difference. The Sisterhood of the Rose is a local group and is part of the Coeo effort, so connect on the the above link to be involved. We need a team to focus energy on the Coeo Global Live Chat by opening the page, turning on the sound and responding when someone messages. To do this right will require some organization, scheduling and information sheets for those monitoring it. This can be a huge benefit to our Mission, so if you can help with this join the Chat Team to say how you can help. We have so much more to do and many more projects that are just a few people and regular effort from making a big difference, but these are enough for now. I’m looking forward to seeing you at the Assembly Meeting Saturday! 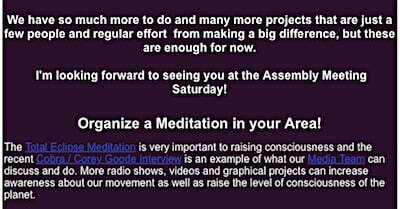 Organize a Meditation in your Area! The Total Eclipse Meditation is very important to raising consciousness and the recent Cobra / Corey Goode Interview is an example of what our Media Team can discuss and do. More radio shows, videos and graphical projects can increase awareness about our movement as well as raise the level of consciousness of the planet. 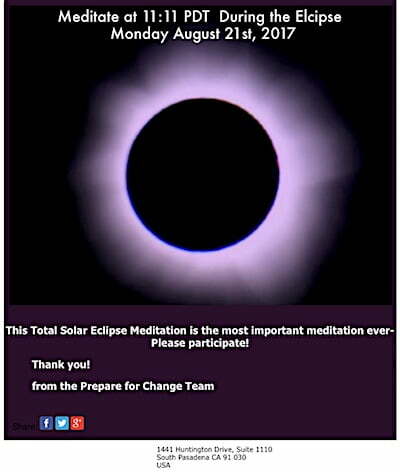 This Total Solar Eclipse Meditation is the most important meditation ever- Please participate! We have a group here in Toronto, Ontario, Canada meeting up at 2:11pm on the 21st to do the Unity Meditation under a pyramid structure right along the shore of Lake Ontario. We have a group meditation planned here in Mount Maunganui, New Zealand. I don’t know for certain but I think there will be many more around the country. For NZ the time will be 6:11:11 am, Tuesday 22nd. Hopefully we get large numbers worldwide. Victory of the Light!